I remember dying Easter eggs with my mom each year and her ability to make the most baeutiful eggs. I’d get so excited to open up Doc Hinkles egg dyes and get painting. Doc Hinkles is the best egg dye out there! 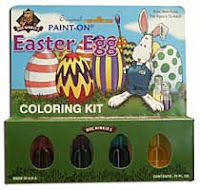 Doc Hinkles egg dyes are strong colors that you apply with cotton swabs onto hot, just boiled eggs. You get the most vibrant colors and have the freedom to make the most creative designs. No dip dying here, you get to unleash your creativity onto these eggs! My mother made the most fantastic eggs each year and I used to try to emulate her designs…the stripes, the dots, the swirls. Something as simple as egg dying turned into a creativity feast. I hope you enjoy the tradition of dying eggs with your kids this year. It’s a tradition they will always remember! Egg dying is fun whether your designs are simple or fancy! Remember the be-jeweled Tiffany eggs made for the Russian monarchs and others? Many cultures use wax to over-lay colors producing intricate designs. Dye mixing is a great way to introduce even young children to some art principles too.